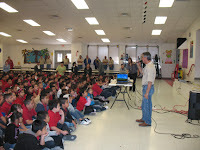 General Ricardo Sanchez Elementary students participated in a bus safety presentation on Oct. 19, 2011. The Rio Grande City CISD bus drivers discussed safety rules, emergency exits and evacuations in case of an emergency. Students viewed an educational video which served to raise awareness and reinforce the importance of following bus safety rules. Ongoing trainings, videos and bus safety tips are implemented constantly during the year to improve students’ safety. General Ricardo Sanchez students and staff acknowledged bus drivers’ commitment and dedication in ensuring our students’ safety to and from school.